Another week has come and gone y'all! It's Friday and that means we've rounded up another list of our FRIYAY FAVES! This week we're talking all about beauty and home. Keep scrolling for this weeks gems! Stila Lipstick is our go to matte lip color that stands through the hands of time. We love the color Patina. It’s great for any skin tone and will make you feel like the Queen you are! This dreamy mirror from Article features natural wood grain and brushed metal. It's perfect because we love the modern feels it's giving us. 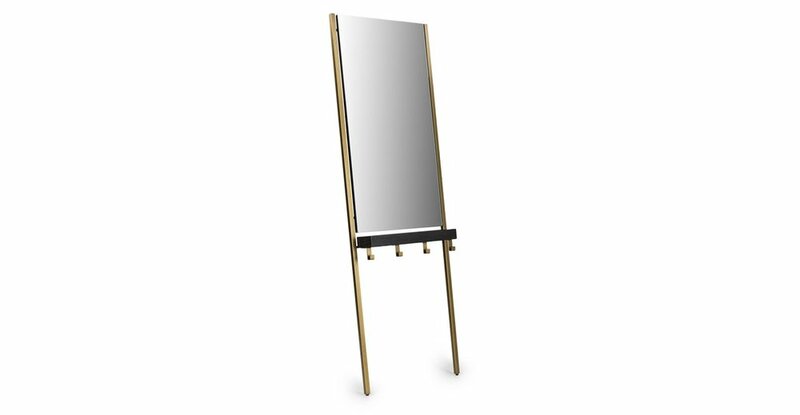 We imagine this mirror going in an entry way since its equipped with a shelf and hooks to hold all of your things as soon as you walk through the door. Does anyone not love Ikea? Well we do and we are also obsessing over this multicolored area rug! It's the perfect piece to bring color into any room. We've got major heart eyes for this rug! We love using this eye cream especially if we spent one too many hours clicking “Yes” when Netflix asked if we were still there. This eye cream contains coffee beans and ginsing to brighten eyes and help reduce puffiness and dark circles. Count us in! We love anything cute that we can set our cocktails or coffee on. These Anthro Rose Quartz Geode Coasters perfectly satisfy our obsession with rose and gold. Rose Quartz also promotes love, self-love, and can bring deep inner feelings of peace. The OHBI gals can always use some more of that! We hope y'all are enjoying our FRIYAY FAVES posts and feeling inspired to try something new! We'd love to hear some of your favorite products or dream items! Comment below or find us on Insta @ohbiofficial. Until next week...we love y'all! Is the 9-5 Keeping you Down? !